The hexa-core Intel Core i9-8950HK processor is supposed to be the crown jewel of Intel’s mobile processor but it made the headlines for all the wrong reason over the last two or so weeks. Trouble began when YouTuber Dave Lee posted a video showing his Core i9 MacBook Pro throttling under severe CPU loads rendering a five minute plus video in Adobe Premiere Pro. While it is not uncommon for notebooks to throttle performance under heavy loads, it was the degree of throttling that was alarming. In the video, Lee’s MacBook Pro could not even maintain its base frequency. More alarmingly, its performance was worse than the last generation MacBook Pro with a Core i7. Apple quickly worked with Lee to find out what was wrong and issued a patch last week that would solve the problem. Apple discovered that the cause of the problem was due to a missing digital key in the firmware and that this affected all the new 2018 models and not just the Core i9 15-inch MacBook Pro. To fix the problem, Apple issued a software update on 25 July, 2018. As expected, the patch fixed the throttling issue. Lee also found the performance of his Core i9 MacBook Pro to be much improved after applying the patch. How will a Windows notebook with a similar processor perform? Does the Core i9 15-inch MacBook Pro still experience severe throttling? Does the ASUS ZenBook Pro 15 UX580 also experience severe throttling? 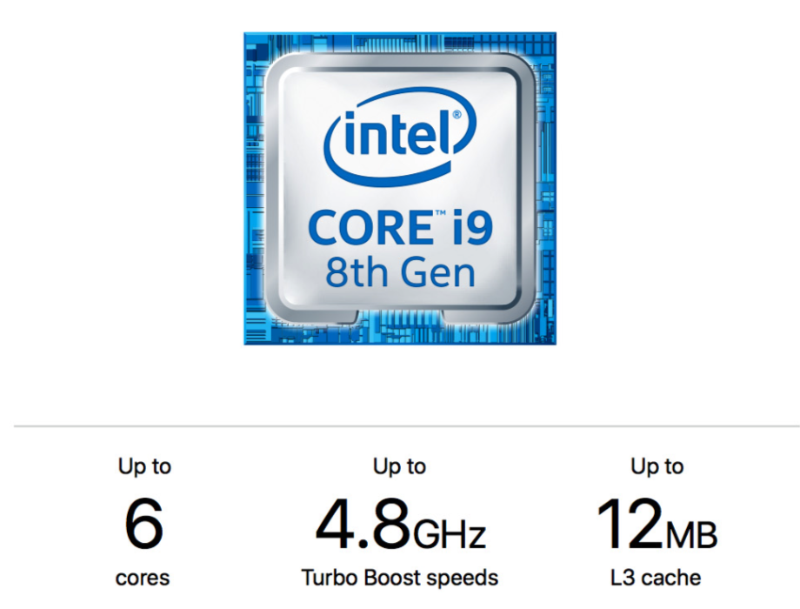 Is there a problem inherent with the Core i9-8950HK processor or powerful and compact 15-inch notebooks in general? Some notes on testing are in order. As I transcoded the video, I used Intel Power Gadget to log the frequencies that the notebooks' respective processors were running at. With CPU utilization at a constant 100%, both notebooks took around 25 minutes to transcode the hour long video. One dilemma I faced during my testing was whether to standardize testing by running everything on a single OS or to run the same benchmarks but on the notebooks’ respective OSes. Eventually, I decided to run the macOS versions of the apps on the MacBook Pro. The reason being that I found that performance was compromised when running Handbrake on the MacBook Pro in Windows 10 via Bootcamp. As you can see in the chart below, running Handbrake on macOS yielded a rather constant CPU clock speed of around 3.1 to 3.2 GHz. In Windows via Bootcamp, the MacBook Pro would manage only manage a measly 2.6GHz. Clearly, the MacBook Pro isn’t as optimized for Windows as it is for macOS, which, of course, isn’t surprising at all. At any rate, the results from this test are quite interesting. As you can see from the chart, the two machines had very different approaches to the same task. The ASUS ZenBook Pro 15 quickly ramped up clock speeds and maintained very high clock speeds for the first three or so minutes. Then after, throttling kicked in and its clock speeds started to dip. At around the 8-minute mark, its clock speeds dipped to as low as 2.6GHz. Thereafter, it kept a steady rate of around 3.1GHz, but there were still numerous dips and spikes. The MacBook Pro, on the other hand, is much more steady in its approach. After an initial ramp up in clock speeds, it quickly settled on a rather constant clock speed of around 3.1 to 3.2GHz. This approach paid off in the end because it took the MacBook Pro 22 minutes and 52 seconds to complete the task, whereas the ZenBook Pro 15 took 24 minutes and 34 seconds. 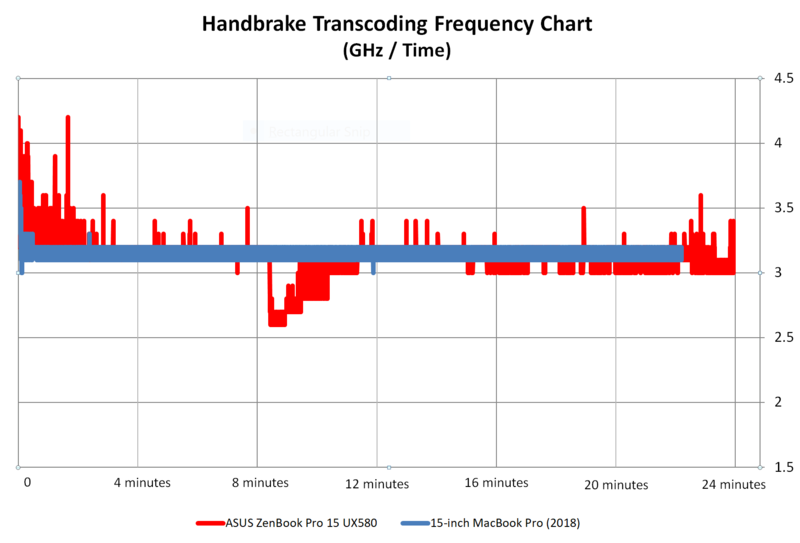 This explains why the MacBook Pro's line ends earlier than the ZenBook Pro 15's. Why are the lines so thick? The above chart was plotted using logs from Intel Power Gadget. We set Intel Power Gadget to record CPU frequency readings every 100ms. This means that over the 24 minute or so run, we recorded around 14,400 data points, hence the thick lines. Cinebench is available for both Windows and macOS, but since I found that the MacBook Pro yielded better results if I ran it on macOS, the MacBook Pro’s results that you see here were recorded running Cinebench in macOS. I ran Cinebench five times consecutively to tax the system and to see if performance would dip. Unsurprisingly, the performance was very consistent. However, it is interesting that while both machines' single-core performance was mostly the same, the MacBook Pro recorded lower multi-core scores. 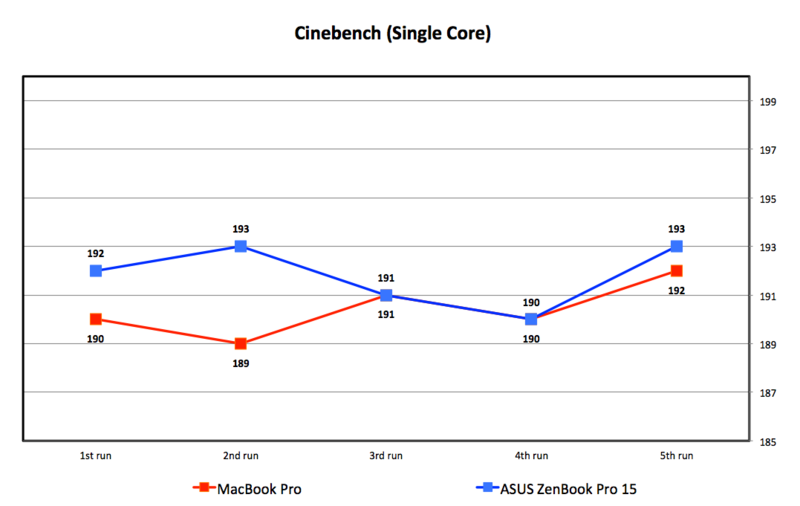 The most likely explanation is that the MacBook Pro was running at more conservative clock speeds than the ZenBook Pro 15. This makes sense because, in the transcoding test above, we noticed that the ZenBook Pro 15 ramped up clock speeds more aggressively during the initial moments of benchmarks and only started throttling after a period of time. 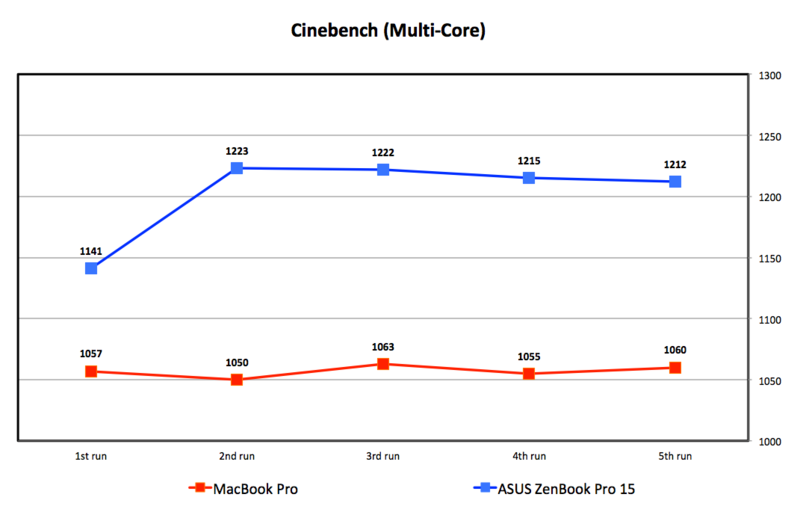 Moreover, Cinebench isn’t a particularly long benchmark, which explains the ZenBook Pro 15's higher scores. 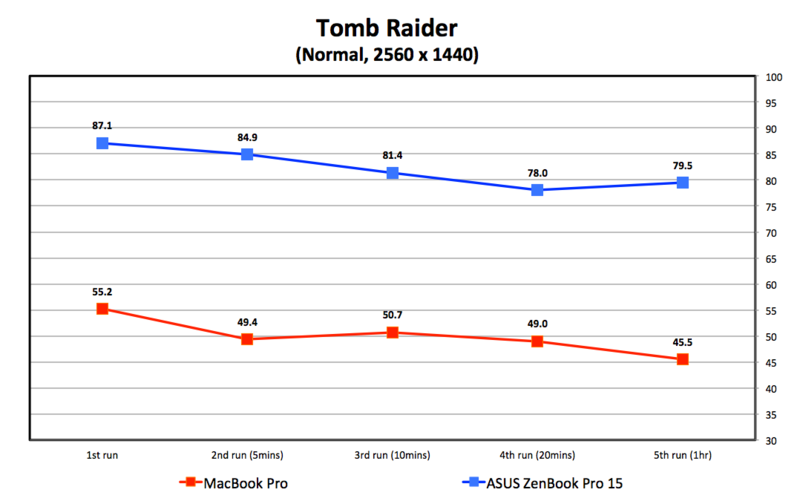 For Tomb Raider, the MacBook Pro was made to run in Windows 10 via Bootcamp to ensure both machine’s GPUs were rendering via the DirectX API. Interestingly, the MacBook Pro’s Radeon Pro 560X ran warmer at a constant 85 degrees Celsius, whereas the ZenBook Pro 15’s GeForce GTX 1050 Ti kept a steady 80 degrees Celsius. For this test, I made five runs at different timing intervals. The benchmark will keep running even after a result is generated, making it an ideal benchmark for evaluating heat soak and throttling. Both notebooks exhibited throttling, though the MacBook Pro was more significant, likely because of its more compact frame. The MacBook Pro managed 55.2 fps in its first run and managed just 49.4 fps in its second - a drop of around 10%. After an hour of continuous gaming, the MacBook Pro recorded 45.5 fps. This translates to a reduction of nearly 10fps, or 17.5%. The ZenBook Pro recorded highly frame rates because of its more power GeForce GTX 1050 Ti GPU. Its first run saw it attain 87.1 fps and its second run saw it dip to 84.9 fps - a reduction of about 2%. After an hour, it managed 79.5 fps, which means an overall drop of 7.5fps, or 8.7%. The ZenBook Pro clearly has the upper hand here as its throttling was much less severe. However, as I mentioned earlier, the MacBook Pro has a more compact chassis. A more compact chassis means a compact cooling system, which in turns means it is less effective at expelling heat from the system. Taking their respective dimensions into account and in terms of outright volume, the MacBook Pro is about 21% more compact than the ZenBook Pro. It's obvious that Apple’s software update fixes the 2018 Core i9 MacBook Pro’s throttling problem. From the tests, I found that CPU performance was generally good and clock speeds held steady despite being put under heavy workloads. GPU throttling is a bit of a concern because a drop of 17.5% is quite significant. But it isn’t the worse that I have seen. I recently reviewed the Core i7 Microsoft Surface Pro and its graphics performance dropped by over 60% after just five consecutive runs! For better or worse, performance throttling is an inevitability in mobile computing, and this is especially true for compact systems. Such systems typically have more tightly packed components and less elaborate cooling systems, which means they are less effective at expelling heat and more prone to heat soak. Until some miraculous newfangled material with high heat conductivity is developed/invented, this will forever remain an immutable law of mobile computing. 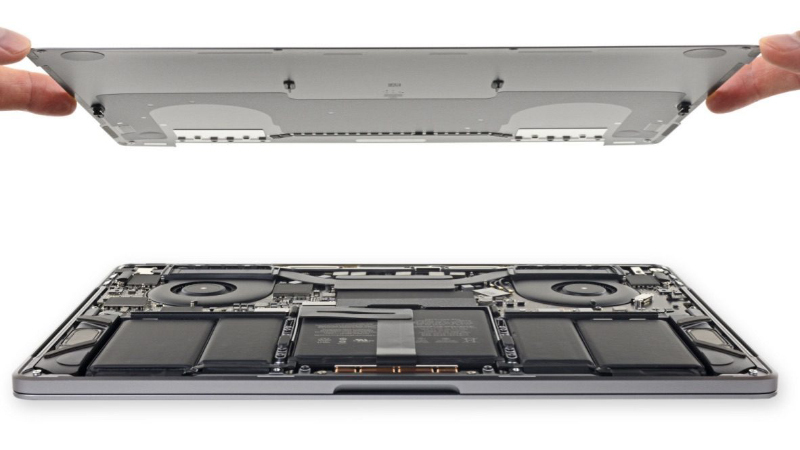 Bearing in mind its dimensions, the MacBook Pro’s performance is actually pretty impressive. Remember, it is even more compact than the ZenBook Pro 15 and it weighs just 1.83kg. You would be hard pressed to find another 15-inch notebook that packs as much top-end hardware in a form factor this compact and light. The only other notebook that can compete in terms of portability is LG’s ridiculously light gram 15. It is just over a kilogram heavy but it is no match for the MacBook Pro when it comes to performance. It trades performance for portability. You see, you can't have your cake and eat it. The ultimate in portability or performance, choose one. But more importantly, this series of tests serve to prove that severe throttling should no longer be an issue with the new 2018 Core i9 MacBook Pro. It performs competitively against an ASUS ZenBook Pro 15 with the same Core i9 processor. If you have deep enough wallets, it is a fine and powerful notebook to have. Stayed tuned for our full review which will be coming soon!